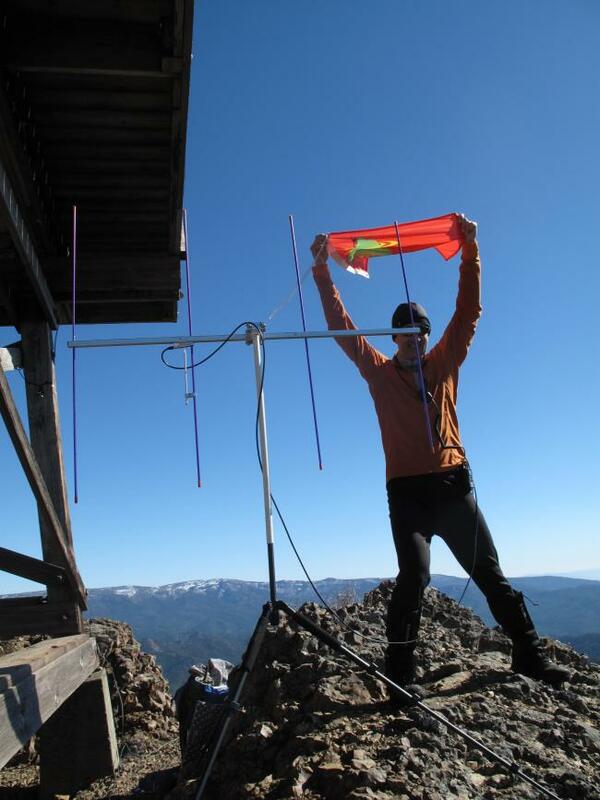 Winter Activation of Red Top Mountain Lookout together with Tim Nair, KG7EJT. 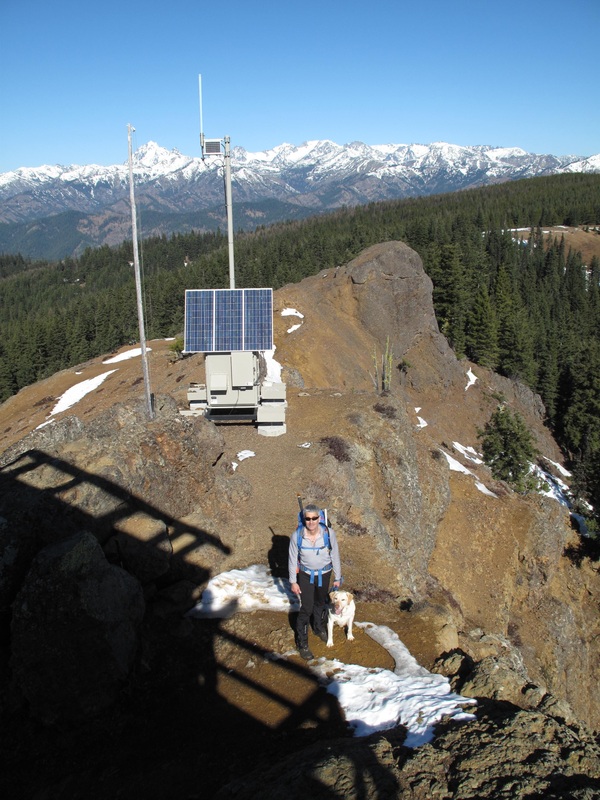 Red Top Mountain Lookout is 5,361 feet elevation (1,634 meters), and is located approximately 15 miles NNE of Cle Elum, Washington. There have been several activations of Red Top Mountain before, but none in winter. 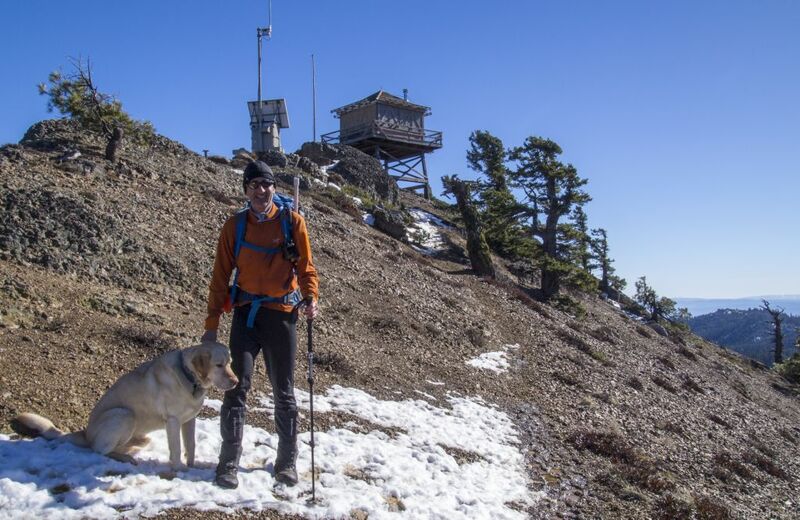 Great weather, very manageable snow, great views and good company, including Dexter the SOTA Dog, made for a fine activation! 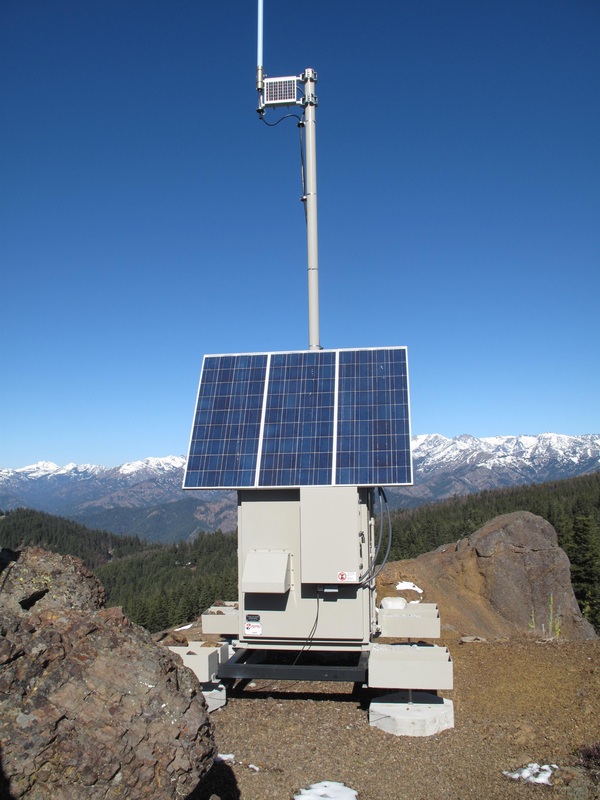 Red Top Lookout is accessible off Forest Service Roads: #9738 then #9702, from SR-97, the Cle Elum to Leavenworth State Road traversing Blewett Pass. We managed to drive FR# 9702 to an elevation of 4,360 feet +/-. Not wanting to risk the increasingly deeper snow on the north and east facing and shadowed gravel road, we parked the car and headed up. We stayed on FR #9702 southbound for a bit, then took a northbound stub logging road, identified as FR 644 on the 2003 vintage USGS map I used for research. Once #644 petered out we traveled cross country over mixed snow, talus and open forest NNW towards the Teanaway Ridge crest. We gained #9702 again, and stayed on road / trail northbound the rest of the way to the summit. The round trip distance was 3.5 miles, with an elevation gain of 1,000 feet. Towards the summit rock formation, we started seeing feline paw prints in the snow. They were so large, that at first we mistook them for bear tracks. 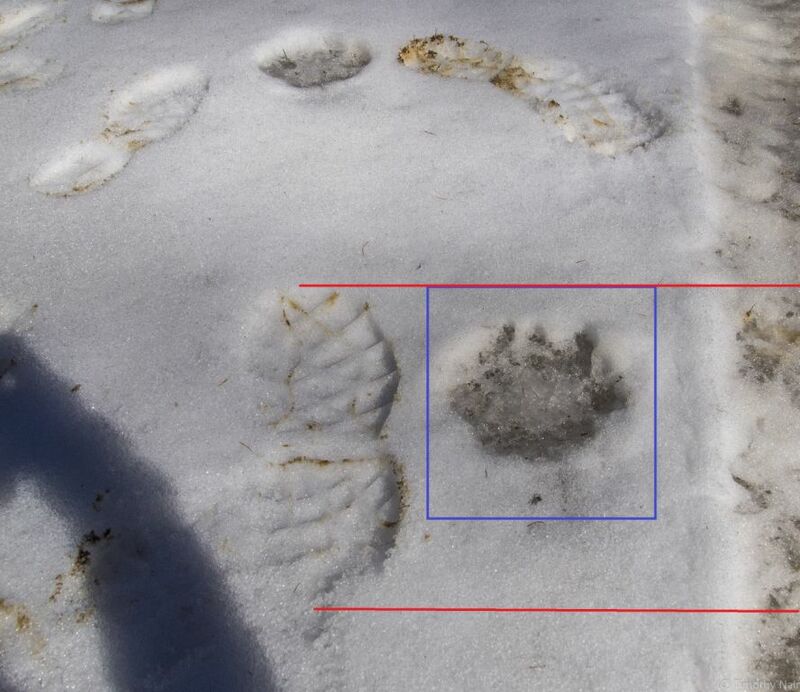 Upon closer examination, we could clearly see the pads and claw marks indicating a BIG CAT! See pictures below. We felt the tracks were probably a few days old, as it has not snowed in the area for approximately 9 days. The tracks were huge, and probably those of a Cougar: http://en.wikipedia.org/wiki/Cougar. Even though Dexter the SOTA Dog is about 92 lbs., he would be no match for a mature Cougar. Luckily, all we saw of the Cougar was the paw prints. We did see plenty of evidence of recent deer, elk and other animal passages of Teanaway Ridge on our route through the mud and snow. 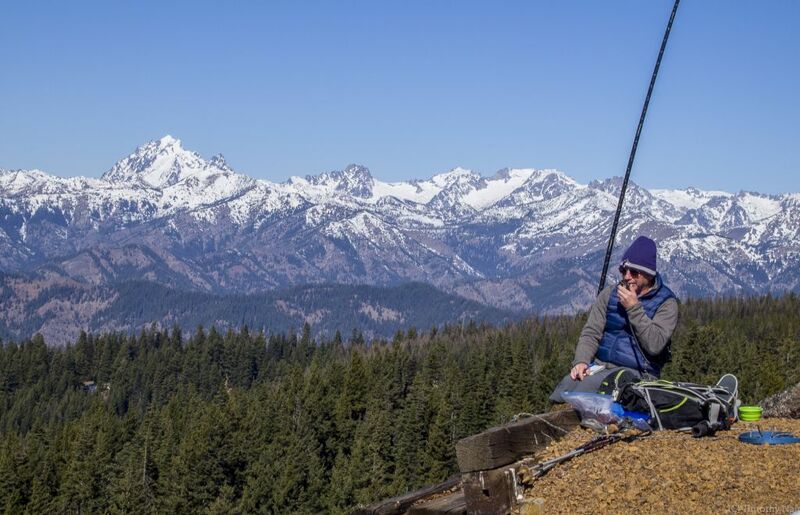 Tim, KG7EJT, again concentrated on 2M FT, using his 4 element Arrow Yagi antenna and hand held Yaesu radio. I worked HF, making contacts on 20M, 40M and 15M, including DX contacts to Japan and France, as well as a contact with Hawaii. I used my Elecraft KX3, 20M + 40M linked dipole strung from my carbon fiber fishing pole, powered by LiPo batteries. Thank you to my contacts: JA0QNJ; JA3YBK; AB7SI; WA7RPM; KD7REM; KQ7X; KA7FHA; TM0T; KH6LC and JA0JHA.